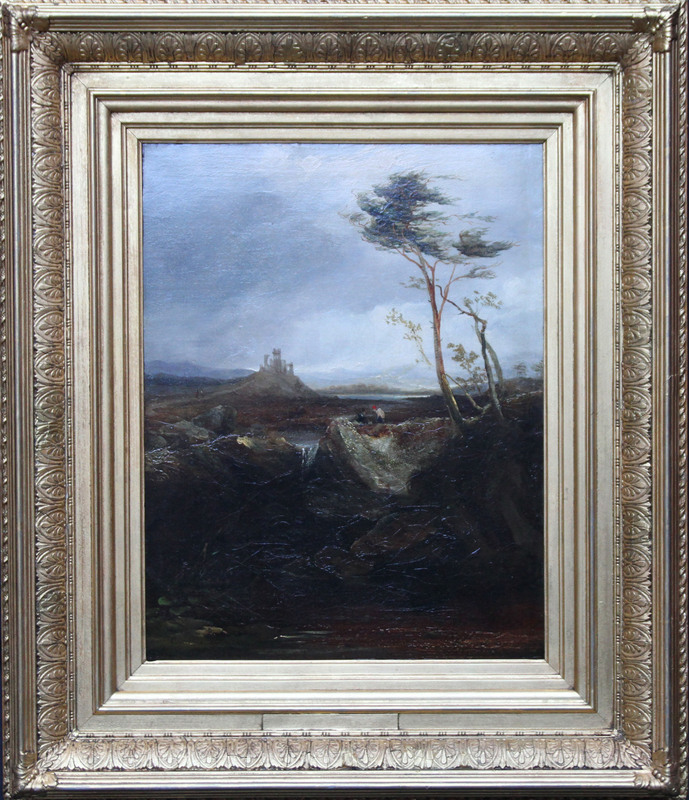 A fine oil on canvas Victorian painting by David Cox. 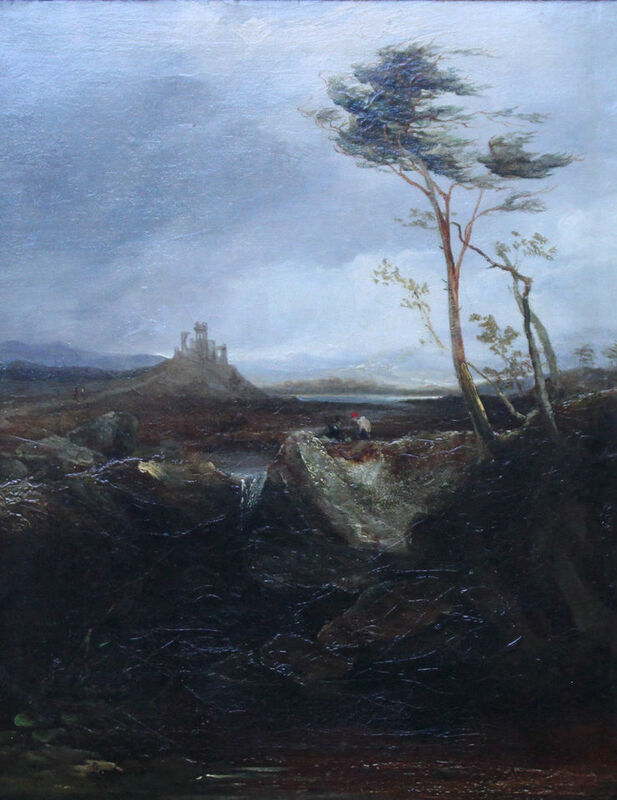 The work depicts a landscape, thought to be Wales, with figures on a cliff and ruins in the background under a blustery sky. Richard Dorment described Cox "as the painter of sudden showers, blustery clouds, and late March winds blowing across the open countryside. The contemporary of Turner, Constable and Bonington, he ranks just below them in the hierarchy of English landscape painters. While Peter De Wint and John Sell Cotman celebrate the stability of the English landscape by painting its shady groves, gentle hills or weathered buildings, Cox's gift lies in his ability to capture nature's shifting light and restless movement with broken, flickering brush strokes." This fine large oil has all these hallmarks. Housed in a fine gilt 19th century frame, 25 inches by 21 inches. In excellent condition. David Cox (1783-1859) was born at Deritend, near Birmingham, the son of blacksmith. In around 1798, aged fifteen, he was apprenticed to a miniature painter named Fieldler. Following Fieldler's suicide, Cox was apprenticed around 1800 as assistant to a theatre scene-painter named De Maria. In 1804 he took work as a scene-painter with Astley's Theatre and moved to London. By 1808 he had abandoned scene-painting, taking water-colour lessons with John Varley. In 1805 he made the first of his many trips to Wales, with Charles Barber; his earliest dated watercolours are from this year. Throughout his lifetime he made numerous sketching tours to the home counties, North Wales, Yorkshire, Derbyshire and Devon. Cox exhibited regularly at the Royal Academy from 1805. His pictures never sold for high prices, and his earned his living chiefly as a drawing-master. Through his first pupil, Col. the Hon. H. Windsor (the future Earl of Plymouth), who engaged him in 1808, Cox acquired several other aristocratic pupils. He wrote several books, including Ackermann's New Drawing Book (1809); A Series of Progressive Lessons (1811); Treatise on Landscape Painting (1813); and Progressive Lessons on Landscape (1816). The ninth and last edition of his Series of Progressive Lessons was published in 1845. In 1810 he was elected President of the Associated Artists in Water Colour. In 1812, following the demise of the Associated Artists, he was elected an Associate of the Society of Painters in Water Colour (Old Water Colour Society). He was elected a Member of the Society in 1813, and exhibited there every year except 1815 and 1817, until his death. In about 1814-15 he was appointed drawing-master at the Military Staff College, Farnham. With his appointment as drawing-master at Miss Croucher's girls' school he took up residence in Hereford. He made his first trip to the Continent, to Belgium and Holland, in 1826, and moved to London the following year. He exhibited for the first time with the Birmingham Society of Artists in 1829, and with the Liverpool Academy from 1831. In 1839 two of Cox's watercolours were bought from the Old Water Colour Society exhibition by the Marquis of Conynham for Queen Victoria. Around 1840 Cox took up oil painting, studying under W.J. Müller. He exhibited two oil paintings at the Royal Academy in 1844. From 1844 until 1856 he spent summers at Bettws-y-Coed, in North Wales. His health suffered following a stroke in 1853. In 1855 he was represented by watercolours at the Paris Universal Exhibition. By 1857, however, his eyesight had deteriorated. An exhibition of his work was arranged in 1858 by the Conversazione Society, Hampstead, and in 1859 a retrospective exhibition was held at the German Gallery, Bond Street, London. Cox died several months later. He was buried in Harborne, near Birmingham, where he had retired in 1841.